At Carpet Cleaning Pleasanton, customer satisfaction is the main goal. Our technicians and cleaners are trained and motivated to go the extra mile while ensuring that your carpets and rugs look good, smell fresh, and is soft to the touch. The very location of the carpet is a major factor that will determine how we clean. 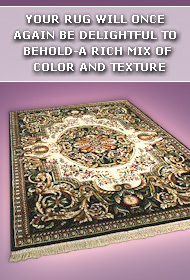 Carpets in high traffic areas like living room, offices, etc., are giving top priority. We use deep cleaning methods to remove the sand particles, food crumbs, allergen causing bacteria, and other stuff that are embedded in the carpet. Grease stains, oil, ink, blood, and other such stains are very difficult to remove with household vacuuming units. However, with our sophisticated machines and cleaning methods, we can wash away all stains and make your carpets look like new again. Pets and little children would always mess up your carpets no matter how hard you try to stop them. Carpet Cleaning Pleasanton have special eco-friendly solvents that would help eliminate the source of the odor and the odor itself leaving your carpets smelling nice and lovely. Don't let stains or odor cause you embarrassments in front of your clients and visitors; take advantage of our unique and state-of-the-art equipment and expertise to get rid of all kinds of stains and odors from your carpets. Whether you are a new tenant around here or you have been disappointed by bad cleaning services, check us out today and you will be glad you did! Contact UCM Services Oakland at 925-398-3388.